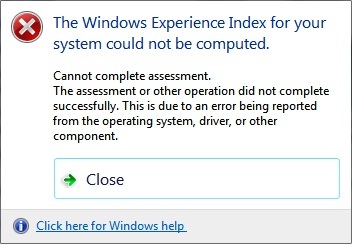 The Windows Experience Index for your system could not be computed – a fix for Windows 7 N Editions. Having just installed Windows 7 Ultimate N on my two year old Dell Inspiron 9400 I thought I would rate the system and get Aero running via Control Panel->Performance Information and Tools. I was surprised when this ‘informative’ error message popped up. Don’t bother clicking on the help link it just launches the generic help and does not give any indication as to what might be causing the problem. I checked my drivers, one concern being my graphics driver, as there did not appear to be a Windows 7 driver for my ATI Mobility Radeon X1400. Searching the forums I found various suggestions which I tried to no avail. Then somewhere I noticed that when running the check windows plays various media files and it suddenly clicked. Windows 7 N editions do not come with Media Player, go here for an explanation. So I hunted down the free Media Feature Pack, installed, re-ran the windows experience tool and hey presto, job done.